NetSuite create great software. BM Online implement great Multi-Company solutions for companies using NetSuite. One System for Multi-Company Business Management Full-featured business software including accounting, CRM, inventory, and ecommerce—all in a single system. Real-time visibility across your entire business operation. Cloud computing infrastructure dramatically lowers maintenance and license fees. Real-time dashboards for all your key employees. Anywhere, anytime access to the information you need. Deep industry solutions for: software companies, wholesalers / distributors, manufacturers, e-tailers, ecommerce companies and service companies. NetSuite OneWorld is an optional module of NetSuite that manages the financial consolidation required of separate companies with multiple charts of account, multi-entity marketing and customer support, the management of disparate sales teams and selling partners, and ability for rolled-up multi-company reporting and business intelligence requirements in real-time. OneWorld allows drill-down to all levels in the underlying businesses—to the item level, the customer, record or to an individual transaction. Only with NetSuite OneWorld can you see consolidated information across all your companies AND the very specific data you are interested in within each OneWorld. The good news is, if all your companies are Australian based it is unlimited companies for the same NetSuite licence price. Real-Time Financial Consolidation NetSuite OneWorld provides corporate headquarters or a parent company with real-time roll-up of costs, revenue, and commissions for all the companies under its jurisdiction. You can populate a single chart of accounts across subsidiaries or companies, or use separate charts of account for each. 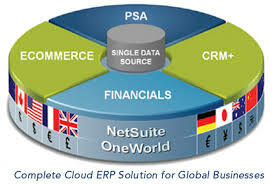 And NetSuite One allows posting between companies through intercompany allocations or journals when needed. NetSuite OneWorld automatically calculates the Cumulative Translation Adjustment (CTA) that results from using different consolidation rates such as average for P&L transactions and month-end or historical for balance sheet transactions. The consolidation rate type used is set at the account level. OneWorld users can go back to any historical period and see all of the detail related to CTA and consolidation entries.